Seagate's premium storage brand, LaCie, has been introducing a wide variety of Thunderbolt 2 products since late last year. We reviewed the 2big Thunderbolt 2 as well as the Rugged Thunderbolt back in July. 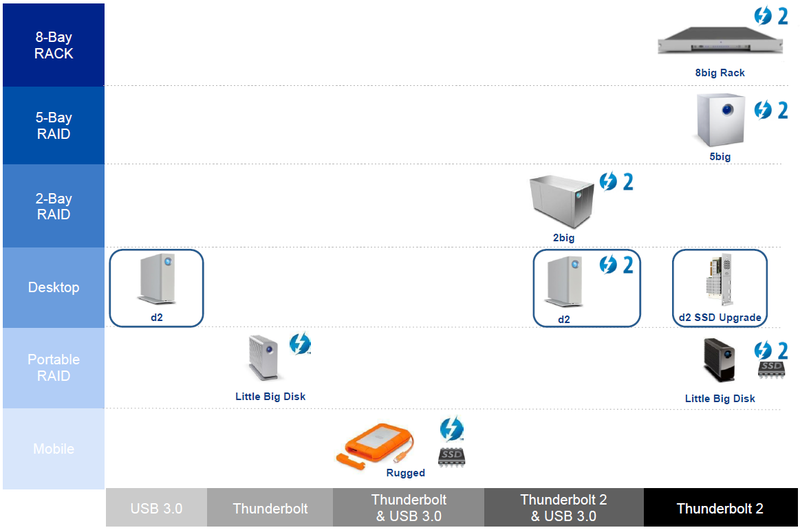 Today, LaCie is adding one more member to their Thunderbolt family, the d2 Thunderbolt 2. The original d2 USB 3.0 Thunderbolt series was, in essence, a hard drive in an external enclosure with support for both USB 3.0 and Thunderbolt (first generation) interfaces. The product being launched today doesn't simply upgrade the Thunderbolt interface to Thunderbolt 2, but brings in some innovative updates. One of the limitations of the original d2 USB 3.0 Thunderbolt unit was the SATA hard drive inside the unit. The new version, by default, ships with a hard drive, but also adds an SSD upgrade option (without sacrificing the hard drive's capacity play). The SSD is PCIe-based and not limited by the SATA bandwidth. The unit is, to our knowledge, the first external hybrid desktop storage drive. As we will see in the performance section, it also happens to be the fastest single-drive desktop storage system. On the external side of things, the new unit also has a slightly different industrial design. The detailed specifications of the review unit are provided in the table below. Evaluation of DAS units on Windows is done with the testbed outlined in the table below. For devices with USB 3.0 connections (such as the My Book Duo that we are considering today), we utilize the USB 3.0 port directly hanging off the PCH. Full details of the reasons behind choosing the various components in the above build, as well as the details of our DAS test suite can be found here. Anandtech, please review external Thunderbolt devices with a Mac system as well. The past three reviews (2Big Thunderbolt 2, Promise M4, and now the d2 Thunderbolt 2) have all been reviewed on a Windows test rig. First off most Thunderbolt users today are likely to be on Mac systems as Thunderbolt is built into all Macs of the last 3 years. Secondly, I don't think this gives particularly accurate results. The main result I call into question is the R/W speeds of the 2Big Thunderbolt 2. These are much lower than Lacie's claims, and slower than the previous version despite using higher density drives (at least on the 12TB model). It seems likely that there is a performance bottleneck in the Thunderbolt adapter or software your test rig uses.